I’ve done the “driftwood” thing before, but seeing as how it’s the last official long weekend of summer AND it’s soon to be my toddler’s first time at the beach, I’m welcoming this aesthetic. 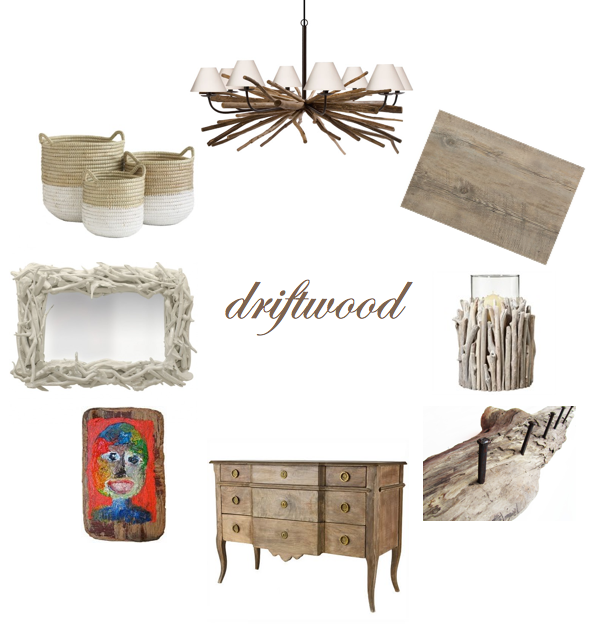 Driftwood is well-worn, loved, warm, and reminiscent of good times and lazy days. 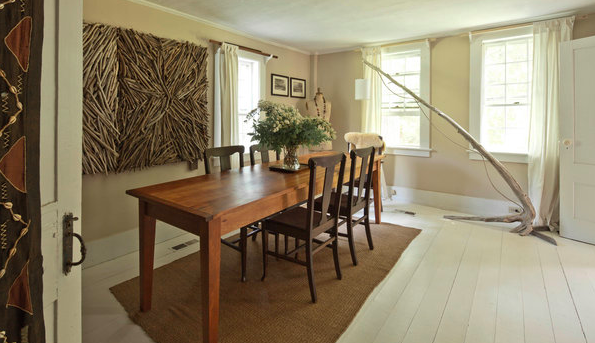 I was recently inspired by it via this article in the New York Times, about a creative couple from Maine who has a lovely home grounded in neutral colors, natural materials, and pure thrift – what an excellent read! The picture above is from their home and features a lamp by its resident, Michael Fleming; his design work can be seen here. Clockwise from Chandelier at top: Provence Chandelier from H&H Collection (image via HHCollection); Chilewich Driftwood Placemat, $12 (image via Crate and Barrel); Driftwood Candle Holder from OKA, (image via OKA); Driftwood Coat Rack via Etsy Seller PepandAva, $50 (image via Etsy); Driftwood Console, once via Wisteria, source unknown (image via Jody Paris Interiors); Painting on Driftwood by Craig Carlisle, (image via Craig Carlisle); Custom Driftwood Mirror from White Gloss, $1350 (image via Houzz); White Dipped Barrel Baskets from Wistera, $60 (image via Wisteria). Whether your plans include spectacularly weathered wood or patchy, hot asphalt this weekend, I hope you have a great one! ← Natural Light Shines Bright!